Translator Fun Voices is a free and lightweight extension for MorphVOX Pro, which will help you easily translate your voices into touch-tone phones, computer beeps, and much more. By using this funny tool you will be able to annoy your IM friends, or even let out farts without eating beans. Translator Fun Voices comes with a rich pack of voices and effects, including Burpalator, Body Noises, Phone Talk, Computer Talk, Random Censor, Random Body Noises, and Xylophone. The utility allows you to play any noise with a single mouse click. 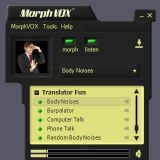 In order to use Translator Fun Voices, MorphVOX Pro must be installed on your machine. The utility is free and lightweight. Several voices and effects are included. Translator Fun Voices - MorphVOX Add-on has been tested by Download82.com team against viruses, spyware, adware, trojan, backdoors and was found to be 100% clean. Our editors will recheck this software periodically to assure that it remains clean.